A family friend (Martin Taylor from Higham Ferrers, Northamptonshire, UK, who served on HMS Ark Royal in the 1960s turns 80 in March. I want to try and track down any surviving shipmates in the UK. Can you tell me where to start? 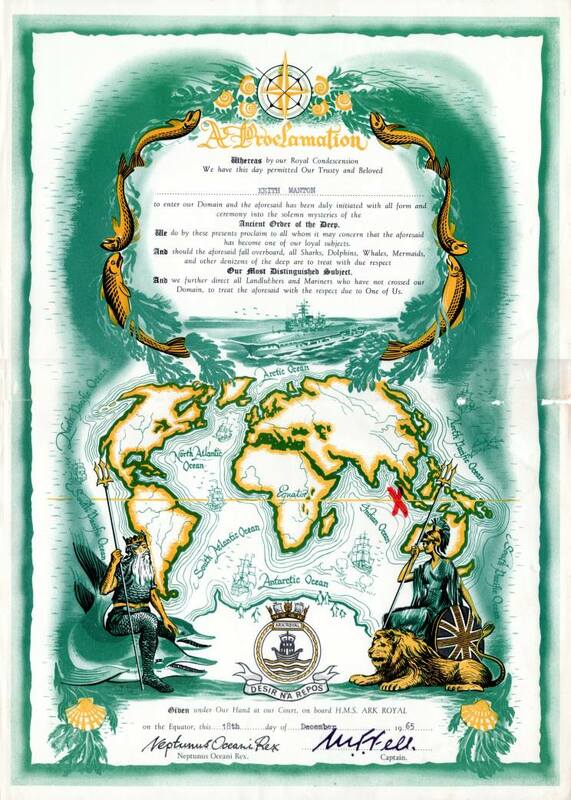 I am looking for information about my birth father called George (surname unknown) - my mother Marie told me he was aged 37 in January 1960 the time of my birth and was a CPO and Instructor on Ark Royal at the time and was on at our of duty in the Caribbean. Originally from Yorkshire he joined the navy aged 17 and completed a full service of ?22 years. he married in 1961. He and my mother never married, but he did apparently visit me and gave me a christening bracelet, which I treasure. I was subsequently adopted, but as an adult had contact with my mother who was 22 when she first met George – I believe they had an on going relationship before she discovered she was pregnant. Marriage however appears not to have been an option,for unclear reasons. The only other information I have is that he was fairly short 5.7” tall, mid brown hair and green eyes. If anyone recognises him I would love to hear more about him as everything my mum said about him suggests I look like him and definitely have similar (positive) personality traits - including a love of the sea and all water sports! I'm looking for information about my father Shaun O'Dwyer who served on the Ark Royal sometime in the 70's (mid to late I think), as well as serving on HMS Whitby afterwards. My dad died a few years ago unfortunately so I am wondering what his time in the Navy was like. He was a cook in the Navy (and not the Lt. Col.) but I struggle to remember much else. He was originally from North Yorkshire if this helps. I came across your web address while browsing for some pictures to put on my website. I do have my commissioning book from my time aboard the Ark Royal (Download it here) from mid 1964, joining while she was still in refit in Devonport to late 1966 when we returned from the trip around the far east, including fire in Singapore, typhoon in Hong Kong, Borneo patrol and the Beira straights etc. It occurred to me that there might be some old shipmates that would enjoy reading a book I wrote about my early life with quite a bit of it covering my time on the Ark. You can learn more by using the link below. I was Able Seaman Keith Manton official number P070000 (yes can you believe that) began my navy life at 15 1/2 at Ganges, and that's covered too in the book, plus other ships of course. I reside now in Marietta Georgia USA an American citizen, but still a Brit at heart Thanks for keeping the memories alive. Keith Manton's Crossing the Line Certificate. I have recently discovered your Message Board and it brought back some great memories. I served as a cook on the Ark from 1961/63 and well remember the visits to Fremantle and Subic Bay described by some of your correspondents. We also visited Okinawa and Mombassa and I think we were in Karachi about the time that JFK was assassinated. We were in 3J3 mess and some names that I remember were Jimmy Green, Jim Carlisle, Jock Bruce, Fife, Cooper, Guttridge, Burton and a chap from Liverpool who was on the ships wrestling team. I went from the Ark to HMS Highburton and finished up on the Juno. I was trawling through the internet looking for who knows what when I happened on your webb site for Ark Royal R09 and there was my photograph staring back at me 2nd in from right back row. I am Bob (Wally) Wallbanks P/M 979168 EM 1 at that time. I look at all those faces and remember them all but regrettably not their names. I am in occasional touch with one ex mate (not in photograph) Taff Bound now lives on the Pembrokshire coast. Following Ark I did Leading Hands course at Collingwood then subsequently served in Forth, Blake, Centaur, back to Collingwood for POEL course and finally Undaunted before before going to Victory Barracks for discharge in 1969 on completion of service. I remember vividly that whole 4th commission. Med fleet, Barcelona, Malta, Pierus, even Majorca before going to the Baring straits for cold weather trials. On completion down to New York as has been said although not the fact that some thousand telephone calls were said to have been received by the NYPD from panicking New Yorkers fearing that they were being invaded as the Mighty Ark fired its 21 Gun Salute as it went up the East river to Pier 90 at about 6am where we all had a cracking good time. (at least speaking personally). I am retired now but living about 3 miles from Collingwood where I am still an occasional visitor (you should see how they live now). If you are able to put me in touch with Don Morrison perhaps between us we could fit a few names to the images. My connection with R09 was not as crew; she was my first and best 'work experience' on completion of apprenticeship at Devonport Dockyard in 1969. The role was observing (later, conducting) and recording results of load and performance tests on the ship's deck machinery including aircraft lifts, DCP's and JBD's, ammunition hoists, capstans, winches, davits and so on. Also NBCD arrangements, air con & ventilation, sonar cabinet cooling, cold & cool rooms and numerous other essential services. The highlight was going on sea trials for 2 weeks during which I had the thrill of witnessing catapult launching of Phantom 4's, including night launches (what a sight!). Still remember the entire 50,000 tons shaking at launch time... Wardroom dining, 2/3 horse's necks, honorary officer status, heady stuff for a 20-year old, Great memories, never forgotten. I am trying to locate any information on a John Alexander Watson who served (I believe) as a Chief Petty Officer on the Ark Royal sometime in the 1960's. Any information would be greatly appreciated, as contact has been lost for 40 years. There was some time spent in Gosport (UK) with a wife and daughter, though that marriage dissolved. Would appreciate just knowing if he is alive or dead, and more if possible. In 1957 I had a pen pal who was serving on the Ark Royal. His name was David Michael (MIKE) Upton. I think that tomorrow is his 72nd birthday. I would love to get in contact with him. Below is a photo of a group of Stokers on the Flight Deck of the Ark. This was taken at Hampton Roads, Va. I'm standing at the rear of the group. Others include, Don Butler, Scouse Foster, Scouse Plunkett, Bill Sykes. I can't put a name to the others i'm afraid. I was serving my National Service 1956-58. I was on the Ark Royal in 1957 heading to New York first ,then Virginia, when we met up with Mayflower 2 . 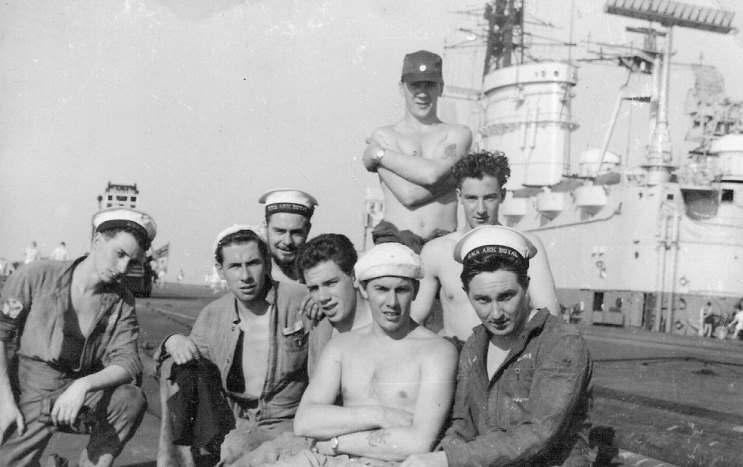 On message 40 you have a photo of a few of the lads on the flight deck , I was in the same mess deck as the two scousers , Plunkett and Foster, they both lived close to me back in Liverpool. I have lived in Canada since 1967' and I am 76 , so I don't think there are too many of us left that witnessed that occasion. I have since been to Plymouth Mass. And went on board Mayflower 2. I was a pilots mate on 898 Squadron when she visited USA and met Mayflower 2 in mid Atlantic. Ark first visited Virginia before visiting New York. I had ten days leave from the ship in Virginia to visit my sister in Ohio, I re-joined the ship in New York. I also visited Mayflower 2 about 2010 or thereabouts whilst on holiday in the USA. Thought I might just put your time frame right. I'm eighty now and I know how memory sometimes gets thing slightly wrong. I'm also a scouse, I lived in Scotland Road prior to joining the Andrew, but have been living down in Bershire since release in 1960. Best of Luck to an old shipmate, Ark was the best ship of the three carriers I served on. The man at the rear right is Don Butler, he is my Dad. He was over the moon to find this picture. He said that another name from the picture was Taff Mantle from Ledbury although maybe not from there now. Any communication would be fantastic. I was wondering if you knew the build number used for the work assigned to the employees within the shipyard during the building of the Ark, whether or not its of any interest to you it was Vessel 1119. Maybe you know this but I just thought it is part of its history and maybe you didn't know. I was an apprentice at Cammel Laird and the road I lived in in Lower Tranmere was Sidney Road and it was directly in line with the slipway of the Ark Royal which was parked there for years before launching. I am looking for my father who served in the Royal Navy in HMS Ark Royal around 1975-1976. His name is Paddy O'brian and would be around the age of 55-56 years old now, unfortunately this is all the information I have about him, but if you would post this on your message board so maybe someone with any information could get in touch with me. I would be very grateful. I recently found your website and was reading the message board for HMS Ark Royal(RO9) when I came across a message No.38. Someone called Tanya Caldwell was looking for her father Paddy O'Brien who served on Ark Royal. He was my best mate and we spent 3 years on the Ark together. In fact we joined up on the same day in 1968. I don't know where to go with this or if its the same guy but maybe you can get in touch with her and let her know. My dad, Peter Twiddy, served on the HMS Ark Royal between 1957 and 1962. I would be very grateful if any of his mates out there would get in touch with me, and maybe make a surprise contact. The old seaman has turned 70 and know he would like to catch up. I am trying to locate Roger Pevalin, from the HMS Ark Royal in 1976, listed as: LWTR Pevalin D134759d, Captain's Office, HMS Ark Royal, BFPO Ships. London. Me and my family met him and his mates while they were on shore time in Ft. Lauderdale, Florida and lost touch over the years. If you have any information, it would be greatly appreciated. Thank you for your assistance. I joined the RN in 1961. I served in the RN for thirty two years - initially as a radio mech, then as Commando Aircrew with 845, 848, 846 and 707 Sqdns. Later I went through the SD system and retired as a Lt/Cdr in 1993. The Ark Royal was my first big ship and later the "Rusty B" (6 1/2 years) and many others. I have the rare distinction of crashing on board Bulwark in a Wessex and walking away from it! I was the Air Ops Officer for a while and later the FDO of Illustrious. Lossie, Yeovilton and Culdrose were my main shore bases. I also served on board SAS President Kruger and spent 2 years on loan to the US Navy. If any of my old mates want to drop a line I would love to hear from you. I just spent the best part of an hour going through the website, recovering loads of memories on the way, all related to the Ark, which I served on in '56/57, 2nd commission. I would like to add a little to the messages posted there; As one of some 2 thou National Servicemen drafted into the RN during those years when the Ark & Eagle would need crews to make up the numbers, I have gained mountains of good memories and am grateful for the reminders. I became a "chockhead" (Naval Airman Aircraft Handler) and learned that I was to become a fire fighter, air crash rescue man. A very relevant part of that experience, as I was to later become a fire brigade officer, and only stopped working in fire safety after 55 years of continuous involvement. On the Ark, I was in 3N2 mess, and part of the red watch deck crew. Also nominated to be "rum bosun" as was down from deck early at watch changes. Took great pleasure in visits to far off places, including Norfolk VA and NY, when the Mayflower was found in mid Atlantic, and shown around NY by a lovely American lady! Been back but no sign of her, but reminisce often with oppo Knocker White, who lives in Derbyshire. Thanks for the prompts. I am trying to locate information on a (?) Cahalin who was a sailor on the Ark Royal in the 1960's or earlier. In the early 1960's he called on family in the Weymouth area but unfortunately no one can remember the details of his visit. At the present time we are putting our family history together and would very much like to place him in the tree, especially as this is the first time a connection with the Ark Royal has arisen. Any assistance that could be given would be very much appreciated. A friend of mine is trying to locate details about a crew member that visited Fremantle Western Australia on the Ark Royal in the 1960's. The crewman was named Michael and the surname was perhaps Lawler, Lawlor, Lawless or something similar. If anyone knows anything could they please respond to my email address. I was a Royal Marine who went on board HMS Ark Royal in 1955 in Birkenhead until 1958. I had lots of photos but lent them to the Royal Marine Association in Glasgow and did not get them back. I would like very much to have some photos of those years. I served as an Electrical Mechanic on the 'Ark Royal' R09 joining her late 1960 and leaving 1963. During that time we did the first sea/deck trials with the HS P1127? now the Harrier and also the Buccaneer. I was starboard crane driver, and electrical storeman with Chief El Jones in 4J1 as well as my duties in the electrical department. There were several members of the crew who had served on R09 from her first commission. These included PO EL Taff Davies. CPO EL Ivor Tope, CPOM(E) Mick MacKernerney (sic), The skipper was Capt D.C.E. F. Gibson. In 1961 we went up the Davis Straits and then to New York before returning to the UK. We went to the Far East carrying out exercises with SEATO ships and visiting Subic Bay, HK, Manila, Singapore, and down to Fremantle. I had special leave with my relatives in Perth who had travelled over the Nullabor from Sydney to meet me. There were three adults and four kids in a VW Beetle towing a small trailer and camping on the way. They had a broken axle at Kalgoorlie before they managed to meet the ship but we had a memorable holiday. I am trying to find an old friend of Barbara of Plymouth who was of black origin and served aboard HMS Ark Royal and was aboard when it sailed from Plymouth on 5th July 1974. Any information will be very helpful. As an old Eng. Rm. Mechanician (Class 1954/55 at MT&RE, Flathouse, or 115 Mess PNB) I'm trying to locate an old classmate who served on the R-09 in 1956/57 as he once sent me a photo of the replica 'Mayflower' rendezvous. From your photo gallery that date would appear to be June 7, 1957. At that time he was billeted in the ERA's Mess and his 'part-of-ship' was the steam catapults as far as I can recollect. His name is Ron Warren, S/n D/KX886396 and he held the Rate on Mech. 1 (CPO) with his last known home address being Mansfield, Notts. My S/N was P/KX 891085 and I would be happy to exchange comment with anyone who knew Ron, or myself for that matter! I served on the Ark from the 1962 refit in Guzz until the October 1967. There was a brilliant photo of the Ark in an Atlantic storm taken by the Airy Fairy photographer of the time, but I have never been able to find..it I believe it was published on the front page the Navy News. During that Far East tour we were Singapore based, but visited Fremantle/Perth and it was over the Christmas period. It was the same period that the Australian group The Seekers with 'The Party's Over ' had the No. 1 spot in the UK. I remember it because the ship's tannoy played nothing else for weeks on end. Dusty Springfield's You Don't Have to say You Love Me and The Harbour Lights of Andy Williams still bring memories of the dullness of the experience. I thought I would send the attached files/pictures in. They may bring back some good memories for old Ark Royal R-09 sailors who were aboard when the BBC recorded their programme in 1976. If only I could turn back time, to once again see my old shipmates, to once again see my old mess, to once again see my old ship. Also attached are some sad photos of the Arks last days in the breakers yard. Gone but never forgotten. Wondered if you can steer me in the right direction to find any photos of my dad. I know he joined the Navy at a young age and we have found his Equator certificate which confirms he was on the Ark Royal in December 1965. When he left the Navy (we think 1967) he was a Petty Officer (not sure what that means). We have his service number but are there any photos we are likely to find all his children would love to see one of dad in his uniform. Unfortunately dad died 3 years ago and we only just found his number and certificate his name was Anthony F. C. Giles from Taunton, Somerset, but most people called him Tony. Would be grateful for any help.